Firefighters today announced that a fourth strike on pensions will take place between 10am and 2pm on Wednesday 13 November in England and Wales. 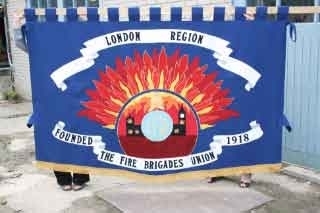 This follows the decision of the government in Westminster to worsen proposals on firefighter pensions. In addition the Fire Brigades Union announced the start of a further ballot for other forms of industrial action, which will close on Wednesday 4 December. On the new strike date, FBU General Secretary, said: “Our members enter burning buildings for a living, and will not be intimidated by the government’s decision to worsen their proposals. This latest attack will simply harden the resolve of firefighters. “Ministers continue to ignore the professional, evidence-based case firefighters have presented over the past three years and refuse to establish an affordable occupational pension scheme which reflects the occupation of firefighting. “Although we still hope the government returns to negotiations, our members have told us that they are prepared for a long, hard campaign if necessary. “As a result we are now balloting for further forms of industrial action. “The fire and rescue service is totally reliant on the goodwill of firefighters on the front line. Many are now performing additional duties and additional hours as a result of central government funding cuts. “There is precious little goodwill left in view of these attacks and that I am confident that will be reflected in this further vote. Fire Minister, Brandon Lewis, told firefighters on Friday 1 November that he had withdrawn June proposals on firefighters taking their pension before 60. The FBU has argued that firefighters are likely to experience a decline in fitness in their 50s, meaning that they would be unlikely to meet the fitness standards required in the fire service. Chief Fire Officers last week highlighted that the government’s proposals would mean firefighters facing a choice between the loss of almost half their pension or dismissal for failing to reach the standards. 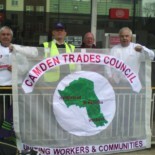 This entry was posted on November 6, 2013 by CAMDEN TRADES COUNCIL.